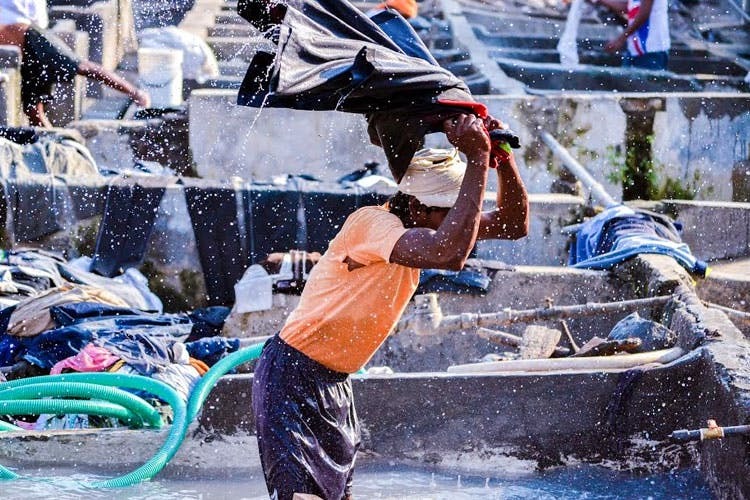 Mumbai Bucketlist: Have You Visited The World's Largest Outdoor Laundry Yet? Want to explore Mumbai? Then Dhobi Ghat has to feature in the list because this gigantic outdoor laundry is one-of-a-kind and the biggest there is in the world. Located next to Mahalaxmi station is Mumbai’s 140-year old Dhobi Ghat that holds a Guinness Book of World Records under ‘the most people hand-washing clothes at a single location’ as of 2011. Visit this place, if you want to see how almost 731 dhobis and their families, through generations have worked here washing clothes from all over Mumbai’s hotels and hospitals. This is worlds largest outdoor laundry and you should visit it if you really want to see the ‘real’ people of Mumbai. I went there a few months ago while I was exploring Mumbai. Just an advice, respect their privacy as that’s their home and so while clicking pictures, we keep that in mind. Well, you can be friends with the kids there and they’ll show you around too. I suggest going in the early hours of the morning as that is when you can see the actual work such as hand-washing of clothes on their flogging stone. You can check out their website here. You could even get some information on this website. Insane pictures and even better stories are a given when you visit Dhobi Ghat – truly a Mumbai gem you mustn’t miss out on.